You like gin and heavenly places? Well, it’s probably for you that the “Slingsby Gin” brand and Hôtel du Vin have teamed up to create a series of multi-sensory Suites inspired by this spirit. Installed in the Hôtel du Vin in Wimbledon, Brighton, Birmingham, York and Harrogate, the Ginspiration Suites have the particularity of being decorated with plants from floor to ceiling. Each of them, created by gardener and designer Matthew Wilson (creator of the famous Chelsea Flower Show), revolve around a botanical theme inspired by Slingsby gin and the 24 plants needed to make it. 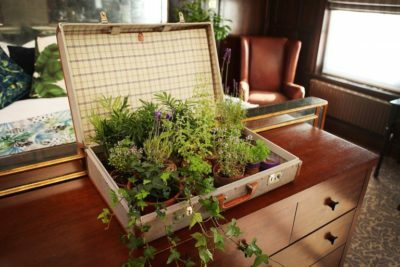 Vintage suitcases filled with herbs of all kinds, cascading foliage, apothecary pots filled with juniper berries or grapefruit (the brand’s key ingredient) serve as decor for the rooms. Each Suite also has a free bar for visitors, containing Slingsby’s award-winning gins (London Dry and Rhubarb) as well as some toppings and other tonics. A great way for customers to immerse themselves in the world of gin.